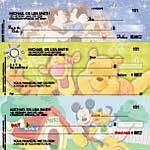 INTERCOT is proud to announce that we have expanded our Store to bring you new offerings from Disney Personal Checks to Disney Fine Artwork. These new products compliment the current INTERCOT Store offerings which include INTERCOT Shirts, Hats and Pins, Disney Vacation Planning Guides, Disney DVD's and Compact Discs, OneShare Disney Stock Purchase, and all online Disney Store merchandise. The Emporium expansion project, under construction for the past nine months, will open for business this coming Friday, September 28. The completely new facility is located on the site that was formerly the Center Street portion of Main Street USA. The expansion will complement the existing Main Street shopping environment. This new attraction will take visitors on an emotional journey that starts with Disney’s birth in 1901 and ends with the company’s vision for the future. The interactive gallery and new film, located on Mickey Avenue at the Disney-MGM Studios, are being readied for the yearlong 100 Years of Magic celebration that begins Oct. 1, 2001. Our sources tell us that the Journey Into Your Imagination ride at the Imagination! pavilion will close for rehab starting Monday, October 8, with a tentative reopening in the summer of 2002. The merchandise location and Honey, I Shrunk the Audience will continue normal operation during the rehabilitation of the ride. No further details are available at this point. Walt Disney Word announced yesterday that the E-Ride Night scheduled for September 25th has been cancelled. What is an E-Ride Night? Approximately a dozen Latin recording artists will fill Downtown Disney Pleasure Island with the sounds of salsa and Latin pop on Sept. 26 for the annual Latin Rhythm Nights Festival. Due to the recent events in our country, the Walt Disney World Resort had cancelled the live performances at West End Stage previously scheduled for Sept. 13-15. The Walt Disney Company announced that it's 100 Years of Magic Celebration will indeed take place as scheduled and will share its magic in all four Florida theme parks. The celebration is a 15-month salute to the 100th birthday of Walt Disney, the creative visionary who gave the world such smile-making icons as Mickey Mouse, Disneyland, the Mouseketeers and the sprawling Walt Disney World Resort. The press event that was scheduled to kick off the beginning of the celebration, however, has been postponed. According to Disney sources, they plan to reschedule that event. US President George W. Bush has designated Friday as "a national day of prayers and remembrance," for the thousands of victims of the attacks on New York and Washington, the White House said Thursday. White House spokesman Ari Fleischer said the president will attend a prayer service here Friday to honor the estimated thousands of victims of the attacks Tuesday, and was "calling on Americans during their lunch hours" to take time to attend prayer services "to pray for our nation." Americans should "attend prayer services at churches, synagogues, mosques, other places of their choosing to pray for our nation, to pray for the families of those who were victimized by this act of terrorism," Fleischer told reporters. The INTERCOT staff is deeply saddened by the tragic events in New York City, Washington DC and southwestern Pennsylvania. Our thoughts and prayers go out to the victims and their loved ones. Listed below are some ways you can help. Walt Disney World Resort is resuming operations of all theme parks, water parks, and shopping, entertainment and recreation areas at normally scheduled times Wednesday morning, September 12. Additionally, Disney Cruise Line sailings will continue as scheduled. The four theme parks of Walt Disney World were closed -- for only the second time in the resort's nearly 30-year history -- on Tuesday in response to the events in New York, Washington, D.C., and Pennsylvania. Resort hotels remained open to accommodate guests. Because of Today's suspected terrorist attacks in New York City, Washington D.C. and perhaps Pennsylvania, the need for blood around the country is great. There is only a one-to-two day supply of blood in the national inventory. The need for blood will be ongoing and continuous. For that reason, the Red Cross is asking people to consider donating blood over the next several days. Call (800)GIVE-LIFE for information on blood drives in your area. According to our source, Disney is closing all its theme parks, water parks, shopping centers, recreation complexes and golf courses. All resort hotels are still open. Administrative and hotel personnel are to report to work. Cast members who work in other parts of the parks do not have to report to work. Central Florida School are allowing parents to go pick up their children. Patrick Air Force Base and NASA are on heightened alert and may go to an even higher alert status. An official from Patrick Air Force Base said "we are taking necessary precautions in lieu of recent events." NASA is still open but the bus tours have been stopped. Actors from ABC Daytime's "All My Children," "General Hospital," "One Life to Live" and "Port Charles" are confirmed to join Susan Lucci ("All My Children") on the roster of more than 30 stars who will be attending the sixth annual "ABC Super Soap Weekend." ABC Daytime once again will partner with Colgate Total Toothpaste as its presenting sponsor of the event, which will be held Nov. 3-4, 2001, at the Disney-MGM Studios. INTERCOT’s WebDisney ( http://www.webdisney.com ), "The Definitive Guide to Disney on the Internet" announced today that its online guide of Disney destinations has passed the 500 site milestone, and now encompasses a grand total 563 Disney-Fan Websites. Founded in late 1998, WebDisney has assembled a collection of high quality links and services for the Disney online community. Less than a month remains until the Walt Disney World Resort begins its 100 Years of Magic celebration, a 15-month salute to Walt Disney's 100th birthday. Beginning Oct. 1, Disney's Magical Moments pins will be available in five different designs throughout all four theme parks. The colorful pins are embedded with tiny lights and will twinkle in a variety of patterns at surprise moments, interacting with live entertainment and park attractions. INTERCOT is proud to announce it has expanded its resort section to include all of the Downtown Disney properties. 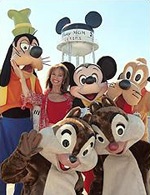 While these resorts are not Disney owned or operated, they offer accommodations as close as some Disney owned properties and have unique amenities of their own. We have also included INTERCOT member reviews of the resorts as applicable.